The Medical Board of Australia (the Board) and the Australian Medical Association (AMA) have joined forces on a national health program for doctors and medical students in Australia. The Board and the AMA have signed a contract for the national delivery of health services to medical practitioners and medical students. The Board will fund the program and a subsidiary company of the AMA, Doctors Health Services Pty Limited (DHS), will ensure nationally consistent services are delivered by service providers in every State and Territory. combine face-to-face health-related triage, advice and referral with telephone help line and online tools and resources where appropriate. Over time services might expand to also include resilience training and early intervention. The Board announced in 2014 that it would establish an equitable national health program for doctors and medical students, funded within existing Board resources from registration fees paid by medical practitioners. Medical Board of Australia Chair, Dr Joanna Flynn AM, said the contract with the AMA marked an important milestone in improving services for doctors with health concerns. ‘The Board is committed to supporting the wellbeing of all doctors and medical students in Australia. Creating health services that are accessible and fair to everyone – and are targeted to meet doctors’ needs – is a really important contribution we are proud to make,’ Dr Flynn said. AMA President, Associate Professor Brian Owler said that the AMA has strongly advocated for improved access to doctors’ health services across the country, and the new arrangements will deliver on that goal. ‘The AMA is very pleased to be playing a central role in this project’ A/Professor Owler said. 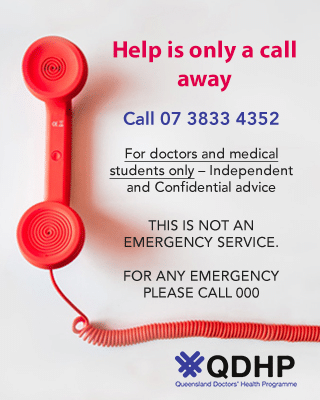 ‘Critically, the services will remain at arm’s length from the Medical Board to ensure that doctors and medical students trust these services and use them at an early stage in their illness’ he said. DHS is a wholly-owned subsidiary of the AMA. Its five member Board will include one person from the AMA Board, a doctor in training, a doctor with experience in doctors’ health, and two independent directors (including the Chair). The DHS Board will be advised by an Expert Advisory Council (EAC) made up of representatives of service providers, doctors in training, medical students, and the AMA. The EAC will provide a forum for sharing information among providers; developing advice to the Board on matters such as program design, and key performance indicators; developing policy on broader doctors’ health issues; and developing common information and materials on doctors’ health.